When low-income city dwellers lack access to mainstream banking services, many end up turning to 'fringe banks,' such as cheque-cashers and pawnshops, for some or all of their financial transactions. This predicament of 'financial exclusion' - faced by those underserved by conventional financial institutions - is comprehensively examined in Jerry Buckland's powerful study, Hard Choices. 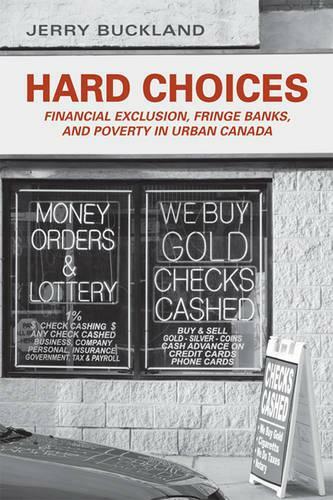 The first account of the nature and causes of financial exclusion in Canada, Hard Choices thoroughly integrates economic and social data on consumer choice, bank behaviour, and government policy. Buckland demonstrates why the current two-tier system of banking is becoming increasingly dysfunctional, especially in the context of new credit products that aggravate income inequality and stifle local economic growth. Featuring a foreword by esteemed economics scholar John P. Caskey, Hard Choices presents pragmatic policy improvements on both the public and private levels that can promote and build financial inclusion for all.